Reeling under intense heatwave conditions, especially in most parts of Rajasthan, western Haryana and NCR and parts of Uttar Pradesh, north India battled the scorching sun on Monday -- World Environment Day. In the national capital, Palam was the hottest at 45.8 degrees Celsius and the maximum temperature in Ridge area was 45.5 degrees, five notches above the season's average. This was still two degrees less than on Sunday when Palam sizzled at 47 degrees. Though maximum temperatures reached 48 degrees Celsius in parts of Uttar Pradesh and Rajashtan, 45.1 degrees in Jammu city and 47 degrees in Delhi on Sunday, weather analysts said easterly winds could bring some respite from Tuesday evening. The average maximum temperature in Delhi was recorded at 44.6 degrees, four notches above the season's average, while the minimum temperature recorded was 33.6 degrees, six notches above the season's average. On Monday, the maximum temperature recorded in Jammu city was 39 degrees Celsius, a six degrees drop within 24 hours. With the temperature rising, even parts of the hill state of Uttarakhand, including Roorkee and Dehradun, faced heat wave-like conditions. According to the India Meteorological Department (IMD), respite was likely in Delhi and other northern areas, except Rajasthan, from Tuesday evening onwards till Friday. Rajasthan -- currently the worst-affected state with most parts, including state capital Jaipur, in the grip of intense heat wave -- would only see respite in next two to three days. "There is heat wave in Palam and Ridge areas of Delhi on Monday. Tuesday morning and afternoon would be hot as well. From Tuesday evening onwards there will be light thunderstorm and rains, which will continue till June 9. So, the respite is likely around the corner," an IMD official told IANS. As per records, June 5 is the hottest World Environment Day in the last four years in Delhi, with heat wave conditions for the first time prevailing in the national capital. According to the private weather forecaster Skymet, the maximum temperature of Delhi will drop by about two to three degrees by Tuesday to reach around 40 degrees from June 7 onwards for three days. "On June 7, 8 and 9, there are fair chances of rains and thundershower activities, so the temperature wiill drop. 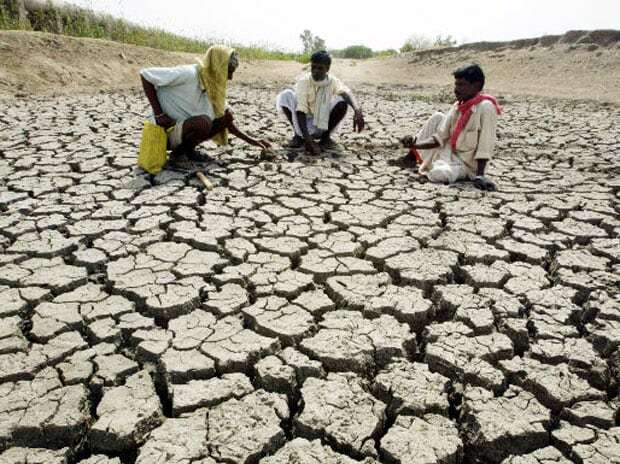 However, from June 10-11, temperature will rise marginally and reach around 41 degrees," Mahesh Palawat, Skymet Director, said. According to Skymet, this is the last round of heat wave in northern India, including the national capital, and after this phase, the maximum temperature will hover around 40 degrees. "By the mid of this month, monsoon is likely to reach Bihar and West Bengal. So, respite is likely in the northern region," Palawat added. On June 5, 2016, the maximum temperature of Delhi was recorded at 43 degrees, in 2015, it was 39 degrees and in 2014 it was 43 degrees, with no heat wave-like conditions. The maximum temperature of Delhi on Sunday touched 47 degrees Celsius, with the average maximum shooting up to 44.6 degrees -- four notches above the normal. Even the minimum temperature was recorded at 30.4 degrees Celsius, three notches above the season's average.